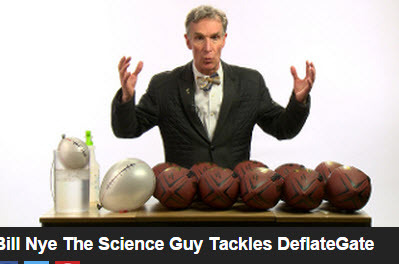 Watch "Bill Nye the Science Guy as he tackles DeflateGate. What is the science behind the Patriots and the partially deflated footballs? Watch the video and get the facts. Our SuperBowl prediction? - at least three times during the game we are going to get a TV close-up on referees checking the pressure of the balls.